Cheery's Craft Haven: Kraftin' Kimmie Krafty Peeks Day 1! WooooHooooo it's PARTY time!!!!! 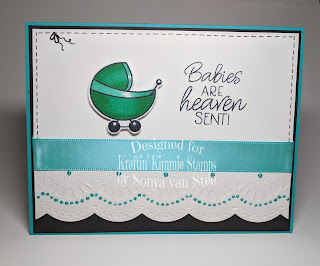 Today is Day ONE of Kraftin' Kimmie Stamps February 2018 release! This month's theme is all about BABIES! So... Let's get this baby shower started with a SWEET new set from Melissa Baker-Nguyen! BABY LOVE comes with lots of images - focal images, smaller accessory stamps, a background stamp, and EIGHT sentiment/word stamps! PERFECT for all of your baby-card-making needs! 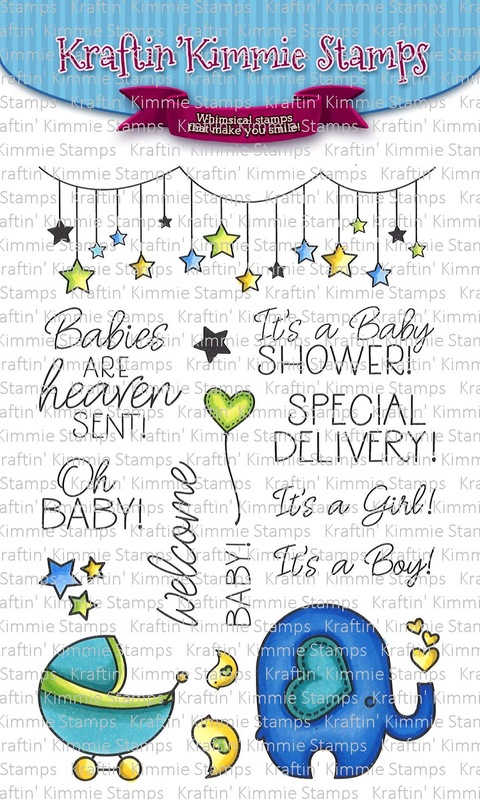 This versatile set is also fabulous for shower invitations, birth announcements, gift tags, scrapbook pages, and whatever else you can think of! Isn't it just the cutest?!?! The Krafty Krew design team members and I have lots of great designs to share with you today featuring BABY LOVE! Be sure to hop around and leave a comment at each stop because... drumroll... ONE lucky commenter is going to WIN a $10 gift voucher to the Krafty Shop EACH DAY this week!!!! And that's not all! We're doing a GIVEAWAY of the ENTIRE release on the Krafty Friends Facebook Page! The winners will be announced at the party so don't miss it! I'm SUPER EXCITED to be included in the Krafty Peeks this month as a brand new Krafty Guest! YAY!!! For my project, I chose the cute little baby carriage and decided to go with a nice clean and simple look. I coloured the image with Spectrum Noir marker colours GT2 and 3, black Copic marker, and a white paint pen for the highlights on the handle and wheels. Then I cut out the carriage and set it aside. I embossed and die cut the edge of the white cardstock to get the scalloped edge, then added a touch of colour with Ranger's Liquid Pearls in the Mermaid colour. The white card stock is then matted on a piece of black and enhanced with a satin ribbon. The top seemed a little bare, so I added some "stitching" with a black pigment liner from Staedtler. And that's when everything went wrong... I smeared ink across the whole top section of the card! ARGH! So now what? Well, X-acto knife to the rescue... VERY carefully I sliced just below the ribbon and removed the top part of the card. 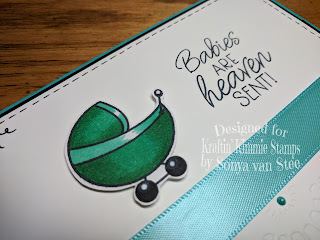 Then I cut a new piece and slid it into the spot after re-stamping the lovely "Babies are Heaven Sent" sentiment in Memento Ink and re-doing the faux stitching. WHEW! I can barely tell! And here's the final project! For the next several days, you'll get to see all the gorgeous stamps sets and inspirational creations from the design team; and then, Sunday morning at 11am EST, you do NOT want to miss the LIVE Online Release Party!!!!!!! That's where Kimmie will be releasing all THREE of the new clear stamp sets! There will be lots of fabulous creations, krafty fun and did I mention PRIZES?! SQUEEEEEEEE! Tune in tomorrow for the next Krafty Peek! Great save on your beautiful card! I love how you turned a simple card into such a lovely look with the die cut edge! Thank you so much, Vonda! I was freaking out at first, but it turned out in the end. whew! I love the edge on your card ! It's a gorgeous card, that goes for a boy or a girl. Love how pretty it is! And I love the fact you also use Spectrum Noirs!! Thanks so much! I was so nervous that I'd have to start the whole thing over again! Awesome card! The details are great. Such a sweet card. 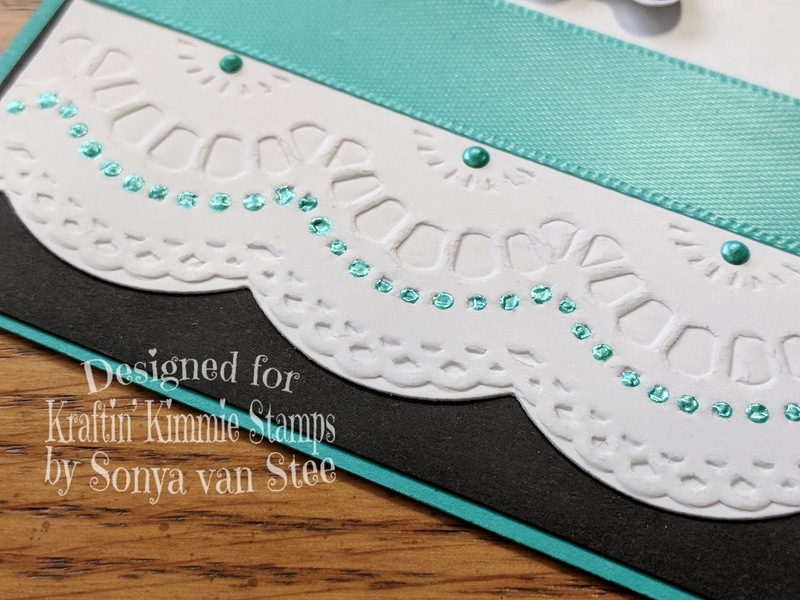 Turquoise ribbon is so pretty and pulls the card together so well.